Why Doesn’t Taiwan Make Political Movies? Films about Taiwan political history are few and far between, especially compared to South Korean cinema. As Asian tigers who have made a recent transition from authoritarian rule to democracy, Taiwan and South Korea have much in common. One area where the two dramatically differ, however, is in what kind of movies and TV shows they make. While politically themed Korean blockbusters come out at a regular clip, Taiwanese ones are almost nonexistent. Let’s start by looking at this year’s top-grossing South Korean film, A Taxi Driver. The film was inspired by the true story of a taxi driver who ferried a German journalist to report on the Gwanju Massacre (also known as “518” for its May 18, 1980 start), in which troops killed hundreds of civilians protesting against Chun Doo-hwan’s military dictatorship. To be fair, one Taiwanese movie about 228 already exists: Hou Hsiao-Hsien’s 1989 New Wave classic A City of Sadness. The film is nothing like A Taxi Driver though. More art house than blockbuster, A City of Sadness never directly shows the atrocities of 228. In it, the violence is implicit — everyone knows it happened, but nobody talks about it outright. To this day, that’s still the most fitting metaphor for Taiwan’s struggles with its recent authoritarian past. Nobody has made another movie about 228 since. Contrast this with South Korea. A Taxi Driver is one of at least six movies featuring the Gwangju Massacre, and one of an even larger set if you broaden the focus to include any movie or TV show that draws inspiration from recent political history. For South Korea, this latter set is vast. There are direct portrayals like The President’s Last Bang, a 2005 film that satirized the 1979 assassination of strongman Park Chung-hee. For more oblique references, look at The Mayor — a movie released earlier this year featuring a Seoul mayor with presidential ambitions, reminiscent of Lee Myung-bak’s trajectory. Even fangirl-rousing TV dramas like 2011’s “City Hunter” have major plot points firmly rooted in South Korea’s authoritarian past. In contrast, political movies and TV shows in Taiwan are rare. Even though Taiwan has had its fair share of martial law, mayors-turned-presidents (Chen Shui-bian), and idol dramas, you will find nothing on par with The President’s Last Bang, The Mayor, or “City Hunter.” Why? Naturally, there’s the China factor. 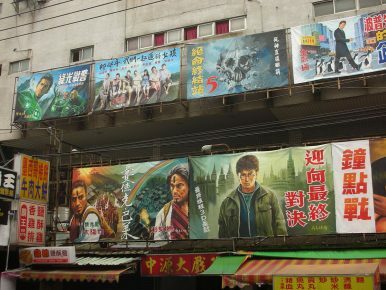 Because Taiwan has the same language as mainland China, there’s significant commercial pressure to make films exportable to mainland audiences. Of course, only certain movies — rarely political ones — can make it onto the mainland. Thus, any Taiwanese filmmaker or actor who wants to make it big would be wise to steer clear of anything even remotely political, for fear of being blacklisted from future RMB windfalls. As a result, there’s a lack of both will and talent for Taiwan to make politically themed movies. Hou Hsiao-hsien is a great example. Though he made A City of Sadness, the PRC of 1989 was far less assertive than the PRC of today. Now, Hou has brought his talents to the mainland, instead making films with unificationist undertones like The Assassin. However, Chinese influence is not the only factor. Any major film with political themes would likely cause controversy within Taiwan itself. Though the island has already seen three peaceful transfers of power, its political discourse remains highly fraught due to a lack of transitional justice; a March 2016 poll showed 76.3 percent of Taiwanese felt such justice had not yet been achieved. Again, South Korea provides a useful foil. Between 1992 and 2007, South Koreans elected three liberal presidents in a row, each of whom implemented wide-ranging transitional justice programs. Since 1992, South Korea has established at least 15 truth commissions, held hearings in its legislature about the Gwangju Massacre (which spawned a law to compensate its victims), put authoritarian-era presidents Chun Doo-hwan and Roh Tae-woo on trial, and much more. Over the past three decades, South Korea has not only enjoyed a highly public political soul-searching, but also held individuals accountable for past wrongs. Even though Taiwan underwent a transition to democracy, it did so without concertedly pursuing justice. This is partially because Taiwan’s democratization came without explicit regime change: even after martial law ended in 1987, the KMT continued ruling Taiwan for another 13 years. Even today, the KMT remains Taiwan’s main opposition party, fully retaining its original name and lineage back to events like 228. Yes, over the past three decades, successive Taiwanese administrations have issued a few reports on 228 and acknowledged the subsequent period of authoritarian “White Terror” through newly designated memorials, basic reparations, and official commemorations. However, nobody has been put on trial or otherwise publicly held accountable for either 228 or the White Terror — and that makes all the difference. Every good political movie or TV show needs a villain. In South Korea, robust transitional justice has produced a collectively agreed-upon list of villains and villainous behaviors. Korean society generally agrees that Chun Doo-hwan was a bad guy, and that his regime killed civilians during the Gwangju Massacre (also bad). Due to a relative lack of transitional justice, Taiwan possesses no such consensus. If someone were to make a movie about 228, who would be the bad guy — Chiang Kai-shek? Taiwan Governor Chen Yi? Some native Taiwanese man who looted weapons from an armory? Everybody has their own idea, but nobody has agreement. The whole point of transitional justice is for a society to openly discuss its troubled past, and create an environment of social trust and mutual agreement in which those conversations can continue unimpeded — including through film. In newly democratic states, political movies can be both contributors to, and indications of, successful transitional justice programs. On this count, Taiwan’s attempts at transitional justice may not have been as “successful” as South Korea’s, but there may still be hope for those who want to see Taiwan make some political blockbusters a la A Taxi Driver. The current Tsai Ing-wen administration has made transitional justice a headline-filling priority, launching probes into KMT ill-gotten assets and promising a deeper report about the White Terror era. It remains to be seen if Tsai’s efforts will extend to providing true accountability, and consequently the “villains” and “villainous behaviors” that Taiwanese political movies would build off of. If they do, then perhaps a Taiwanese Taxi Driver may yet be in sight. Anthony Kao is a technology product manager in the Silicon Valley. He founded and writes for Cinema Escapist, an online home for commentary on foreign and independent films. Kao studied modern Chinese history at the University of California, Berkeley. From memorials to vandalism, Taiwan continues to remember its history -- and debate its future.